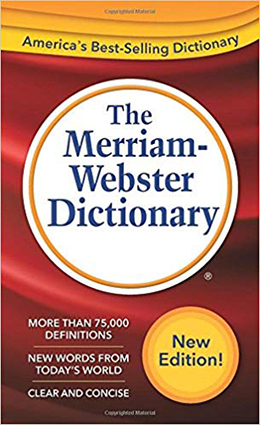 Merriam-Webster Dictionary is a completely revised edition! This best-selling language reference covers the core vocabulary of everyday life. 70,000 updated definitions. Includes pronunciations, word origins, synonym lists, and abundant usage examples. Updated to reflect groundbreaking Merriam-Webster's Collegiate Dictionary, Paperback, Eleventh Edition. Copyright 2016.